The recipe for a great book includes characters that you connect with and a plot that you can believe in. When these ingredients are put together, you have a book that you will not want to put down. Author Mia King does just this in her new book Table Manners (August 2009). Table Manners picks up the story of Deirdre McIntosh that King introduced readers to in Good Things (2007). Her simple life is more complicated than ever. Deidre McIntosh finally has all the ingredients for a perfect life. She has her own line of cakes and cookies, and the perfect boyfriend, Kevin Johnson, one of Seattle’s top bachelors. Creative, energetic, and loving, Deidre is the person friends go to when they need a helping hand. But when Kevin’s ex-fiancée, the sultry and successful magazine publisher Sabine Durant, suddenly appears in Seattle, it’s Deidre who needs help. Already intimidated by Kevin’s glamorous, moneyed world–and his sister, who wants Deidre out of Kevin’s life–she knows she’s no match for Sabine. Deidre turns to her friends for advice, but finds they’re having crises of their own. When her business begins to slip from her fingers, Deidre knows she must to do something to keep her career and her love life from imploding. Can everyone’s favorite go-to person save herself? 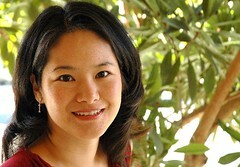 National bestselling author Mia King is the author of three novels, GOOD THINGS (2007), SWEET LIFE (2008), and TABLE MANNERS (2009). Her books have been printed internationally and are selections of the Doubleday, Literary Guild, Rhapsody and Book of the Month book clubs. Mia lives in Hawaii where she is currently at work on her next novel. Last summer, I kept reading review after review for the book Sweet Life by Mia King. I was intrigued by all of the positive remarks that people wrote. I decided to pick up a copy and devoured the book over two days. I even wrote about it since I was actually able to put my knitting down in favor of this book. I was immediately able to call my self a Mia King fan and decided to read Good Things. King’s style of writing is captivating. You quickly transport ourself into the world of her believable characters. When I was finished reading Good Things, I wanted to continue on and know more about Deirdre McIntosh. What happened to her and Kevin? Would Deirdre’s life continue in a positive direction after her walks around the lake? When I was given the opportunity to read Table Manners as part of a review for The Family Review Network, I jumped at it. Like a little kid, I stayed up late and read in dim lights reading through the book with delight. Each page brought me closer to finding out what happened to the likeable Deidre McIntosh. I absolutely loved this book. Seriously, the characters lives grew in depth as I read more about them. We watched as Deidre problem solved through several sticky situations and baked more amazing sweets (which inspired my need to bake). When I was finished, I once again found myself wishing for more. Rather than spoil it, let me just say that I want to know how life continues to play out for Deidre, Kevin, Marla, and Lindsey. A special bonus in each of Mia King’s books, including Table Manners, is the section of mouth watering recipes included at the end. In Table Manners, the recipes were all of the items that were served at William and Alain’s Buffet. I can not wait to try some of them. 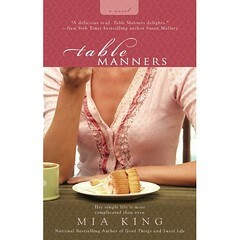 If you are looking for a great book by an author that knows how to connect to her readers, then I highly recommend Mia King’s latest book Table Manners. One suggestion, just make sure to read the introductory book about Deirdre McIntosh called Good Things. This post was written for Family Review Network as part of a program for Mia King, who supplied me with the book for review. No compensation was given and all opinions are my own genuine feelings. I’ll have to check out one of her books sometime. When I have time!